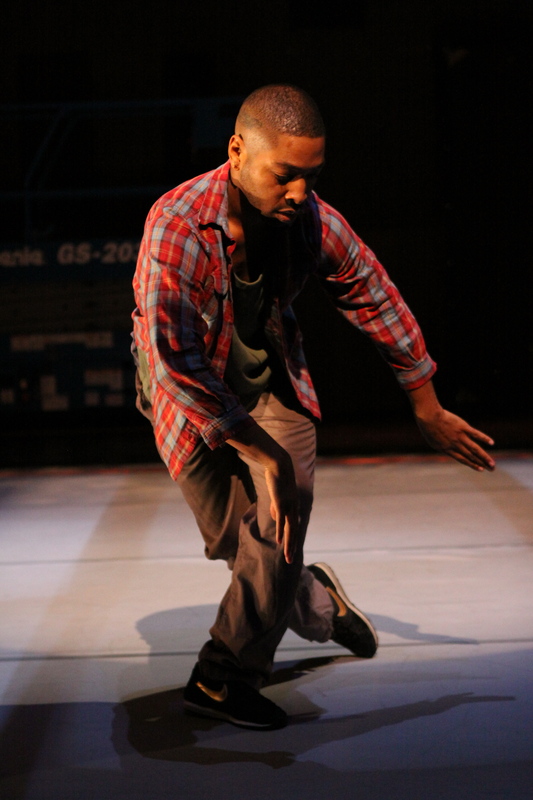 Kyle Abraham, who appeared for the first time last year at the American Dance Festival with his marvelous dance The Radio Show, is back this year with a two-performance run on the big stage at the Durham Performing Arts Center. He and his company Abraham.In.Motion danced Abraham’s ambitious work Pavement on June 28; the program repeats tonight, June 29. Abraham is starting to look like a new-generation Bill T. Jones. His intellectualism is not yet as deep or pointed, but he is showing a penchant for making dances about Big Stuff–without scrimping on the dancing. At least at this early stage of his career, Abraham allows more emotion to show than Jones generally does. I believe that is a good thing for the art, since its there for a reason, not as a crutch. Kyle Abraham in Pavement. Photo: Steven Schreiber. Abraham is a beautiful dancer (see above–look at those hands, their elegance in relation to the legs and feet), and his company all move beautifully in his style, which is a heart-stretching amalgam of ballet, modern and street dancing. He seems to have crafted this style in aid of an almost cinematic narrative form of dance theatre, and mostly it works very well. The new piece Pavement returns us to Abraham’s hometown of Pittsburgh, also the source for The Radio Show. But Pavement shows tough times in the town that was previously such a beacon for black culture. Very early on, we see a young black man laid face down on the pavement, his hands crossed in the small of his back, as if in handcuffs. 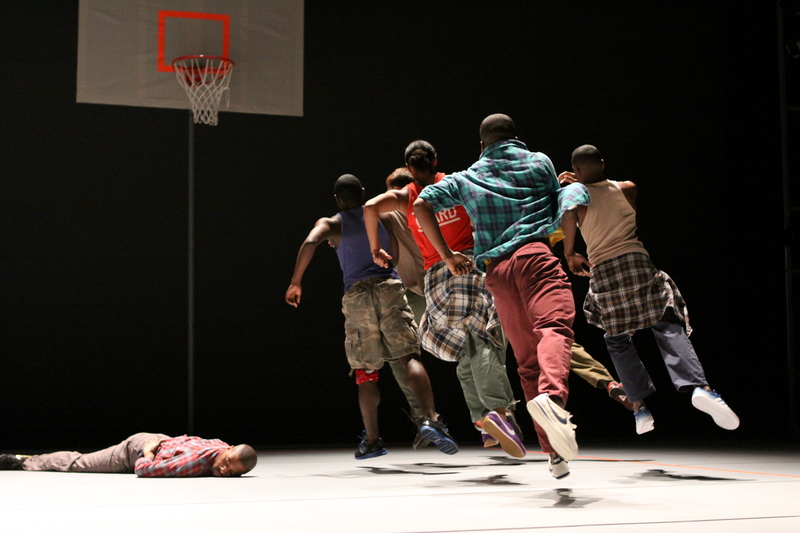 This happens over and over during the piece, and the tenderness of the movements only serve to make it more searing. Overall, Pavement could use a little tightening up. It wanders and gets a bit murky in the middle, and the balance between theatre and dance is wobbly throughout. For this viewer, there was some confusion at times about who was what to whom, as many characters flow through the seven bodies on stage. But again and again, Pavement reels you in with a powerful scene, powerfully danced. Abraham is clearly going to be a force in American dance in the 21st century, as we continue to sort out history and search for a fresh cultural vitality. A few slow spots just give the viewer time to catch up with Abraham.In.Motion. A.I.M in a scene from Kyle Abraham’s Pavement. Photo: Steven Schreiber.